People born specifically on the 17th of August are believed to be full of versatility and mental discipline with the usual Leo refinement and charm. The ruling astrological planet for this particular day is Saturn giving you a strong minded will and lots of capability and persistence. If you have this birthday your fairly tolerant and forgiving nature makes you ordinarily cool and calm in a crisis. You are naturally true to yourself, trustworthy, charitable and compassionate but emotion can soon sway your way of thinking and actions. Expressive and original your thoughts and ideas are likely to be very focused while your fun loving exuberant side enjoys making others smile. Individuals with an August the seventeenth birthday are generous, dependable and far sighted with great organizational skills and a convincing eloquence. Despite your general enthusiasm and optimism you have a tendency to sometimes succumb to negativity and brooding. A versatile and capable temperament comes in useful to a person born on the seventeenth of August when it comes to choosing a career. Your abilities to focus and organize direct you to be efficient and competent at any type of work and your sense of humor brightens any working environment. You are often especially good at researching information so ideal occupations may include this sort of task. Whatever the state of your current finances it is highly unlikely that you will be tempted to overspend. Whenever you have a healthy income you will try and save towards some future financial security. For a Leo, the person born on the seventeenth day of August is typically extremely loyal in friendship and love partnerships. You will usually have a traditional view of romance and a desire for loving permanence and emotional stability. You seek a true soul mate and in spite of your idealistic standards and expectations you simply truly want plenty of reassurance and devotion from a partner. Bursting with sexual energy you like to be in control but you are normally unselfish in your efforts to please your loved one before yourself in the bedroom. You adore being admired and appreciated by your other half and will probably find that massage and pampering help you relax and ignite your libido even more. Protective and emotionally rather sensitive you can be a tad difficult to live with and are always deeply hurt by betrayal or a wounded pride. Healthiness experienced by those born on August 17th could be better and most illness limited with a little bit of extra care and attention. You are inclined to be once in a while too neglectful of health and frequently take your well being for granted. On top of this you may in addition be susceptible to issues regarding stress therefore effective relaxation could be particularly important to maintain vitality. People born on this day are overly energetic physically and mentally so getting adequate sleep is commonly one of the essential requirements and advice for preventing periods of unhealthiness. Your main strengths of character are exhibited in your enthusiastic expressiveness, way with words and originality, getting you easily noticed in a crowd. Other recognizable fortes are seen in your flexibility, tolerance and dependability allowing you get along famously with the majority of others. The personality weaknesses for those born on August 17th are uncovered when you occasionally slip into a negative mood and capitulate to your likelihood to brood. This moodiness can every so often initiate your antagonistic streak occasionally presenting you as uncharacteristically hostile and argumentative. Being born on the 17th of August destines you to be incredibly disciplined and bestows you with plentiful avidity. These attributes alongside your intuitiveness are excellent motivating assets for the achievement of goals. You tend not to set specific ambitious intentions and will usually concentrate your efforts on acquiring success in your chosen profession, close relationships and in a better understanding of yourself. You are likely to frequently dream of your desired aspirations and this gives you a supply of reserves of inspiration, direction and positivity to draw upon when needed. 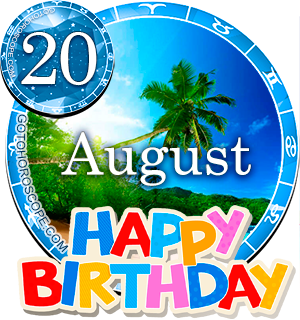 As you were born on the seventeenth of August the one and seven in your birth date award you a Root number of Eight. This numerical reference to your birthday has the keyword 'Leader' placing emphasis on your multitude of discipline, adaptability and acumen. The 17th mystic Tarot card in the Major Arcana, the Star, is associated with your birthday. This represents your high-spirited refinement and admirable traits of tolerance and forgiveness. The lucky gemstone for August the seventeenth birthdays is a Black pearl, wear it to assist with self acceptance and for the attraction of prosperity. The anticipations of all Leo personalities are astrologically deduced from the assumed influence of the Sun. The actual day you were born on, the seventeenth of August is governed by Saturn's authority adding the little perceptible differences you have from other zodiac Lions. Your willpower is especially strong and works well with your additional wonderful characteristics of capable reliability and generosity. Your bighearted lenient temperament and the touch of calmness in your temperament generally gives you a clear perspective on life. If you are able to recognize the triggers of and avoid succumbing to cynical or gloomy vibes it should help you tone down your occasional hostility and make you a tad less contentious too. A concluding thought for people born on the seventeenth day of August offers the suggestion of three possible improvements. These proposals are to attempt to moderate your intensity and observe yourself closely, doing so could prove advantageous if you wish to find the most favorable paths. Is it just me, my fellow August Seventeeners or do u guys feel so lonely sometimes? Like you really dont have anyone to properly connect with. I guess I�m just really broody but I wish I had a banging social life sometimes. Anyways good luck my dear brothers and sisters and keep holding on! I agree to most but I'm not a pushover, I'm the one to be afraid of, the one that defends everyone. I take control but let someone else lead. Who is like me? Most things are pretty right about me.I think am very loyal and strong. 8/17/1995 in my opinion those of us born on the 17 are the epitome of August for example 1+7=8 8 representing our month. Im 17 aug 1988 too. Do you over analyse? And worry? Wow so nice to meet you all. my year is 1988. Tomorrow is tghe 17. Happy Birthday to us all. am female Taurus born, April 26 1991. I read this sign n I really love to have friend. can I be a friend Bright. of course it says u are best with Taurus. 17 August 2000 <3 Anyone wid same ? Hi, I was born August 17th and I have the same problem you do, I don't keep hatred in me and the people I work with think I am fake bcos of this. Tbh th only thing I will say is love is everything peace stay humble. women !Nothing as beautiful as your heart surrender in the radiant offering of your devotion. Your love opens my heart and endlessly even when I would otherwise forget loves depth. Just hit 13 today .... The only thing I kinda didn't like was the part where it said we're active I mean I am but I have a thiroid issue which make me keep wait... I pray I lose it whish me luck p.s. HAPPY B-DAY?!? This may sound gross to you but a bit of research on it will prove my words to be heaven sent. Urine therapy will cure your thyroid issue. Avod fluoride or fluoridated water or products. Mix borax pwder 1/8 teaspoon to every 1 gallon of tap or purified water u drink to remove fluoride from the water and from your body and calcification of your pineal and thyroid glands. Vortex your drinking water and read up on the power of vortexing your drinking water. Meditate and find a nice large quartz crystal to aid in meditation and healing. Spread only thoughts and words of love and happiness. God bless. As we are forgiving every body in the world for what ever others are doing is not insulting character, what others think, but it is one of the character of lord Visnu, "forgiving others" ...enjoyee.. the life, and most of the the people in 17th august born are satabicha nakhestra, we are just healers....enjoye this characters...our character is to save others. I hate my forgiving nd generous nature,,in dis world people dnt deserve dis ! !its better to be straight forward or political!!!! I agree with ABC. Due to our forgiving and generous nature, we are not respected and seen as nave and not liked because of the same. That's exactly the August 17th born Characteristics and We are Born to Ruler as a Loin in the Jungle. It's how I look like when I was a kid, but now almost everyone mistaken me as Virgo. I think already lost my personality.